Earlier this year, I wrote about an ESP8266 based RGB LED “AI Light” lightbulb that was hacked to run ESPurna open source firmware. That’s all good, except some people tried to get one, and ended with a different hardware. So if you’d like something that’s more of a “sure thing”, ITEAD Studio has designed Sonoff B1 dimmable RGB LED E27 light bulb based on ESP8285 processor, and with a “4 pads” to allow for custom firmware flashing. Beam Angle – 120 degrees typ. 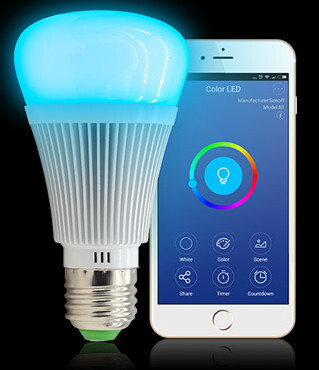 Sonoff B1 with stock firmware can be controlled using the usual eWelink Android / iOS app to turn the light on and off, define timers, select the color, and/or dim the light. The aopp also supports 4 scenes for resting, reading, partying and casual use that you can customize as you wish. The LED bulb is also compatible with Amazon Alexa, and Google Assistant services so you can use voice commands to control the light instead. Bear in mind that you may need to wait a little longer to get custom firmware working for it, unless you are willing to get your hands dirty. But this looks so similar to “AI Light”, that I’d expect a port not to be too difficult. You can purchase Sonoff B1 light bulb for $18 + shipping on ITEAD Studio website. I’m more concerned about the brightness level for itead’s own smart bulb. RPi Zero W would be a little too big for this purpose, and you don’t really need a “powerful” processor for this, so ESP8266/ESP8285 are better suited to the task. RF Bridge – now your 433MHz/315MHz RF devices can be control by cellphone , and make the RF device works with Alexa and Google home. Can a single remote control multi-lamp control?